Hello Honey, today’s card is a no stamping card that is quick and easy to make. I went with the Hello Honey color scheme using Stampin Up DSP and coordinating 3/8″ Hello Honey Satin Stitched ribbon #133671. For the main focal piece I just used the Lovely Lace #133737 textured impressions embossing folder and cut it into a square then added some rhinestone bling to jazz it up. This card makes a great all purpose card. Baby it’s cold outside and it is a snowy forecast but that is expected in central Ohio in Jan. Today’s post is a real beauty that Cammie made using her masterful brayering and sponging skills. She even magically made the tree reflection glisten in the snow. Her unique color combo added to the beauty of this design. She used the Lovely as a Tree #128655 stamp set from the Stampin Up annual catalog and accented with glimmering silver stars and ribbon. Happy birthday to my Gem of a Friend, Debbie. To honor her milestone birthday, I used a gold color scheme and accented the card with the Stampin Up Watercolor Wonder Washi Tape #133000. 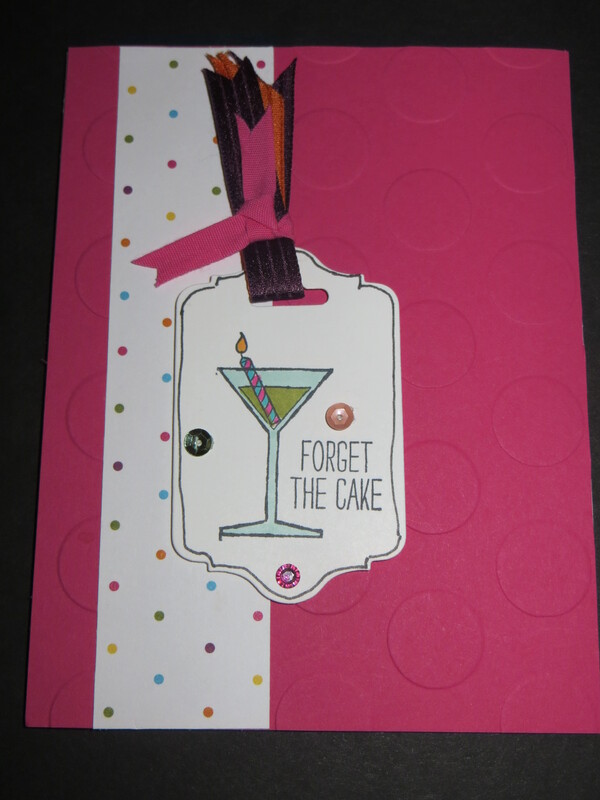 I then used the all new One Tag Fits All #138583 from the new Stampin Up Occasions catalog. The One Tag Fits All stamp set coordinates with the Note Tag Punch #135860. I matted the tag on another tag cut from the Chalk Talk Framelits #129983. I used the gold foil specialty paper and Black stazon ink to stamp the gem. I added a Large Rhinestone bling it up even more for my special and dear friend. Make new friends but keep the old… one is silver the other gold! You definitely take the gold Debbie! Have a great day. Not much stamping for this bright and bold thank you card. 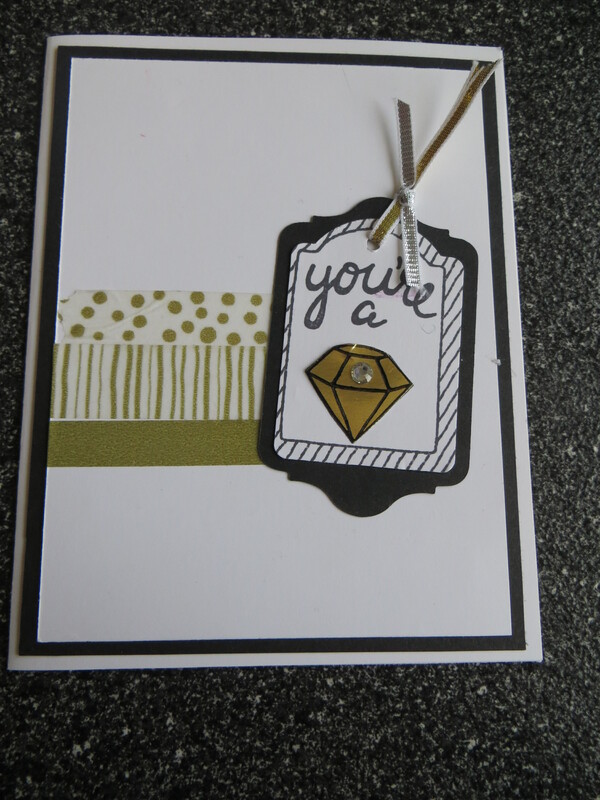 I had scraps of Stampin Up Flower Pot DSP #133698 laying on my desk so I made a quick card. 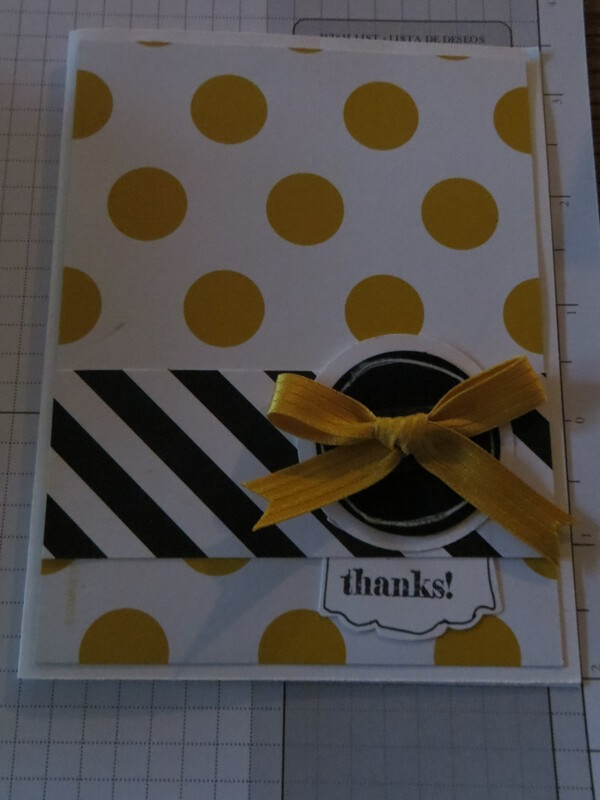 This card could be used for any occasion but I needed a Thank You card and so I stamped the thanks onto an Artisian Label #130920 punched piece, added a couple of punched circles and finished off with a piece of Hello Honey 3/8 ” Stitched Satin Ribbon #133671. 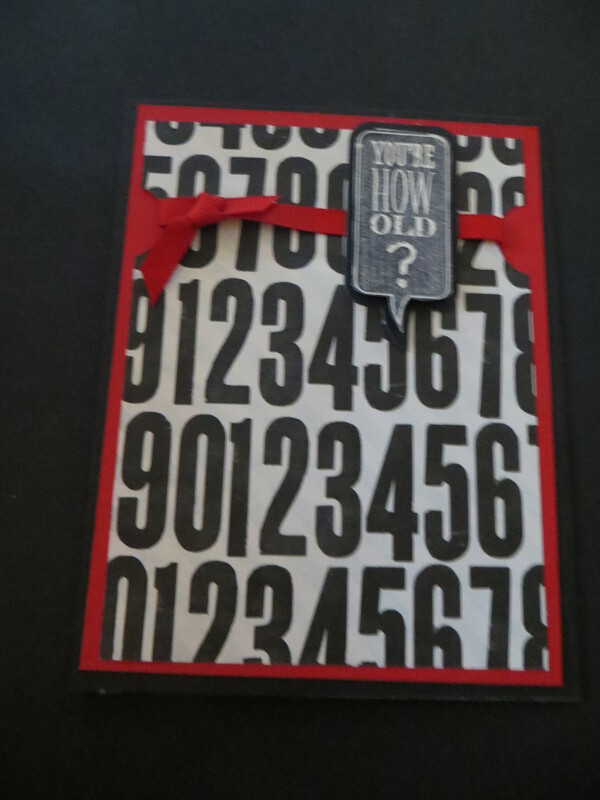 Today’s post is a fun one and a play on numbers birthday card using the fabulous Typeset #133704 DSP. I added a piece of real red gross grain ribbon and the sentiment from the Just Sayin #133203 stampset and then cut with the coordinating Word Bubbles Framelits #132968 from the Stampin Up annual catalog. This card is a quick and easy way to send to anyone with a milestone birthday or for those that won’t admit their age. 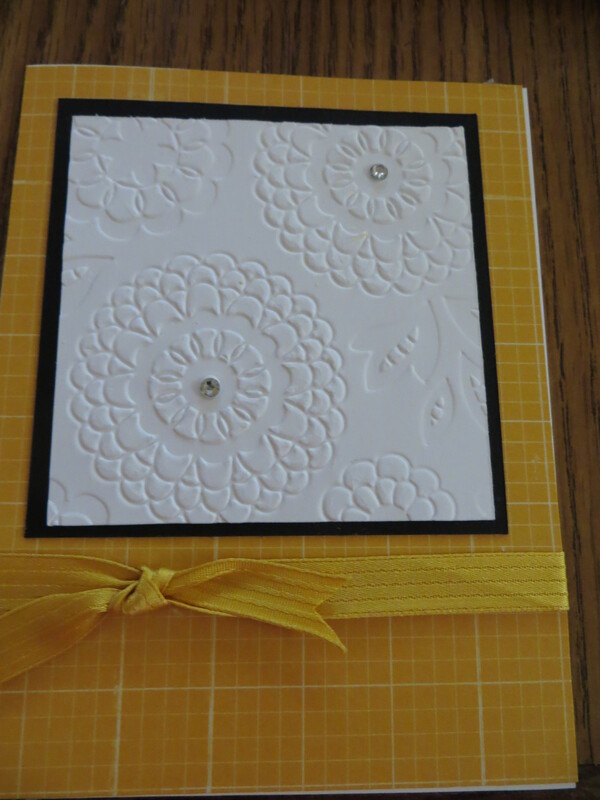 Today’s post is a simple layout for a birthday card but it as always the layout can be applied to any occasion. I used the Stampin Up Large Polka dot textured impressions folder #133739 and a strip of Sweet Taffy DSP #133693. I cut a label using the Chalk Talk Framelit #129983. 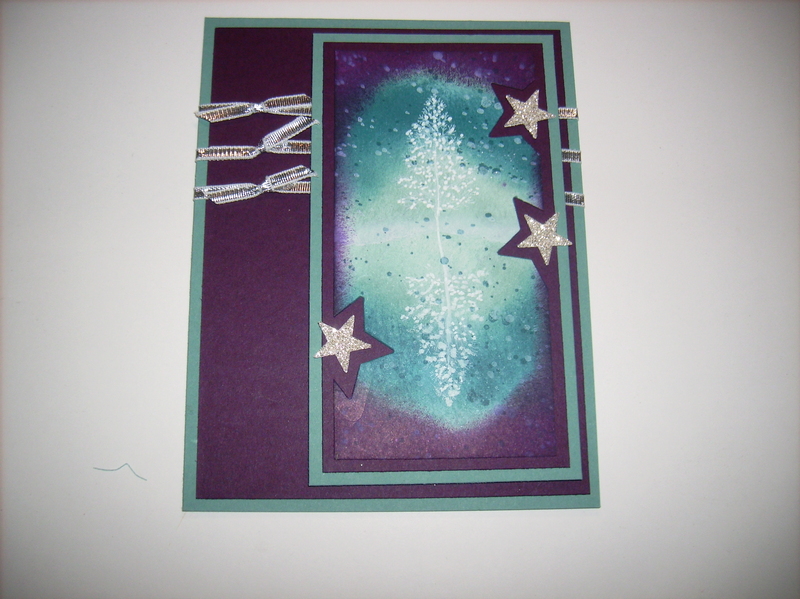 I added the stamped image from the now retired Making Spirits Bright #135089 stamp set and colored it with Stampin Up Blendabilities. I added some ribbon and sequins to give it some texture to complete a fun birthday greeting. You spoke up and we listened. Last year I did not post Christmas cards on the 25th of every month and we heard lots of complaints; so we are bringing Christmas back every 25th throughout 2015. 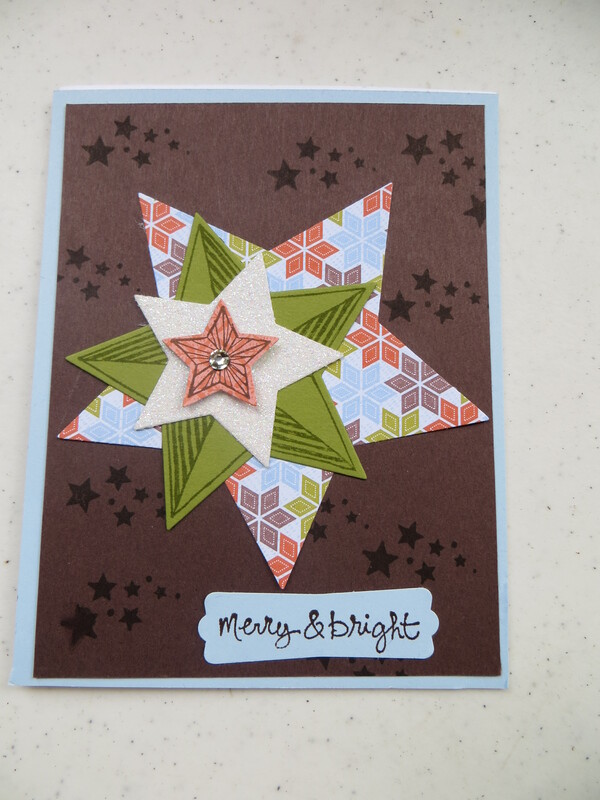 Today’s Christmas post uses the Stampin Up Be the Star #135734 stamp set and coordinating Star Framelits #133723 and I layered the stars in a random pattern to create a festive Christmas card.